There has been much investment in Downtown Wichita, both public and private. What has been the trend in business activity during this time? What has been the result of this investment? If you expected business growth in downtown Wichita, you may be disappointed. Business activity in zip code 67202, Downtown Wichita. Click for larger. 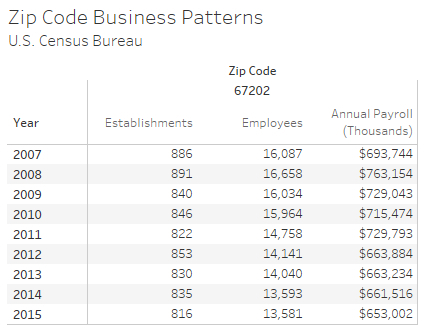 The United States Census Bureau tracks business data by zip code.2 The data that is available includes the number of business establishments, the number of employees, and the annual payroll, expressed in thousands of dollars not adjusted for inflation. It includes private-sector workers only, so it does not count all workers. Nearby are results for zip code 67202, which has nearly the same boundaries as the Self-Supporting Municipal Improvement District (SSMID). This is a district that pays extra property tax for supporting the WDDC. Its boundaries are from Kellogg north to Central, and the Arkansas River east to Washington. It is greater Downtown Wichita plus Old Town. 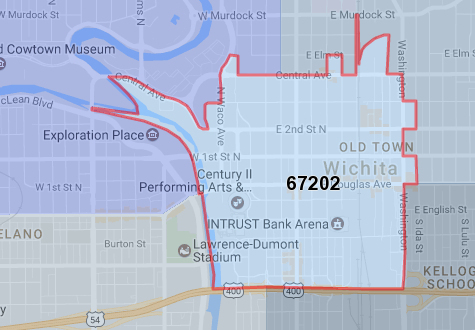 The results since 2007 show fewer business establishments, fewer people working downtown, and lower earnings generated in downtown Wichita. In all cases, the trend is lower. This is movement in the wrong direction, the opposite of progress. There may be good news in that the number of people living downtown may be rising. 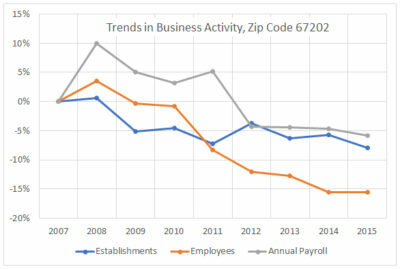 But business activity is declining. 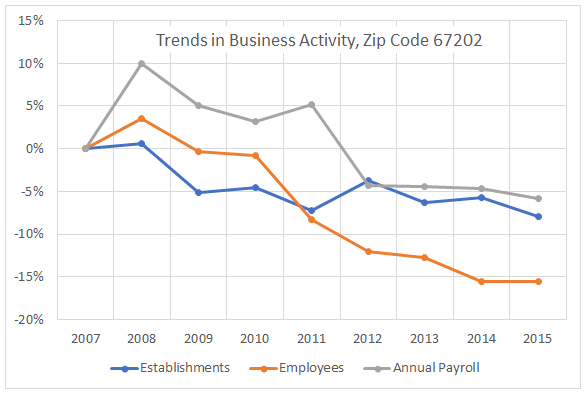 Trends in business establishments, employment, and payroll for zip code 67202, which is Downtown Wichita. Click for larger. Previous PostFake government spawns fake newsNext PostWhich Kansas governor?